Herbs, annual, cespitose. Culms trigonous, (5-)20-60 cm × (0.2-) 0.6-2.4 mm, glabrous. Leaves (1-)3-4, V-shaped, 15-40 cm × 3-6 mm. Inflorescences: spikes 2-5(-8), oblong to ovoid, 2-10 cm × 3-12 mm; rays 4-8, to 11 cm; bracts (4-)5(-7), ascending at 45°, V-shaped, (1.5-)8-30(-50) cm × 1-6 mm; rachilla persistent, wingless (successive floral scales 0.7-0.9 mm apart). Spikelets 10-30, compressed, linear to ellipsoid, 4-20 × 1.5-2.1 mm; floral scales deciduous, (2-)6-26, laterally brown to golden brown, edges clear, medially green, 5-ribbed, outermost ribs more noticeable than others, obovate to nearly orbiculate, 1.3-1.8 × 1.2-1.8 mm, margins emarginate, apex with mucro 0.05-0.12 mm. Flowers: stamens 2(-3); anthers (0.2-)0.3-0.4 mm, connective tips reddish, less than 0.1 mm; styles less than 0.1 mm; stigmas 0.2-0.4 mm. Achenes brown, slightly stipitate, obovoid, 1.2-1.4 × 0.5-0.7 mm, apex apiculate, surfaces puncticulate. Fruiting summer-fall (Jul-Oct). Damp to moderately dry, disturbed soils; 0-500 m; introduced; Ala., Ark., Calif., Conn., Fla., Ga., Ill., La., Md., Miss., Mo., N.Y., N.C., Okla., S.C., Tenn., Tex., Va., W.Va.; Mexico; Central America; South America; Asia; Africa; Australia. 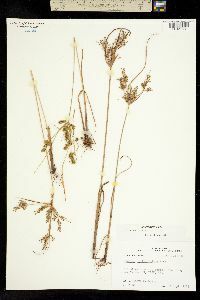 Cyperus iria was first recorded in the New World from the southeastern United States in the 1840s. Tufted annual to 6 dm, with rather short, basally disposed lvs; rays usually well developed and commonly branched at the top; spikes loose and open, 1-2 cm, bearing several rather distant, ascending spikelets; spikelets 10-20-fld, to 1 cm; rachilla persistent; scales broadly obovate, rounded-emarginate, scarcely mucronate, 1.2-1.7 mm, with green midrib and golden-brown sides; rachilla wingless; stamens 2 or 3; achenes trigonous, 1-1.5 mm, blackish. Swamps and muddy ground; native of Eurasia, intr. in se. U.S. as far n. as s. Ill., Ky. and se. Va.